The City of Oconomowoc, Wisconsin recently completed a $7.2 million expansion project for its 37 year old wastewater treatment facility. Improvements included adding a secondary clarifier, retrofitting a chlorine disinfection system with an ultraviolet disinfection system and adding more bio-solids storage. These improvements extended the lifespan of the facility, while doubling the previous water treatment capacity to 5.5 million gallons per day (12 million gallons peak flow) for some of the major components of the plant. As a requirement of this upgrade and expansion, all new materials had to ensure multiple years of functionality without any of the maintenance hassles of traditional products. Due to previous successful installations, Donohue and Associates specified Strongwell products for three key portions of this project: basin covers, walkways and stairways. 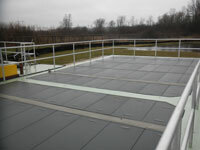 COMPOSOLITE® was used to make the covers for the large UV basin (20’ x 50’), with some panels spanning 24” x 60” – something comparable aluminum covers couldn’t handle. In this instance, FRP provided more value, corrosion resistance and structural support. Each of the panels also contained a lift handle for easy removal and replacement of the covers. DURADEK® was used for low maintenance walking surfaces for both indoor and outdoor surfaces. Fabricated EXTREN® stairways and 2” x ¼” handrails were utilized for easy access to the mezzanine areas.